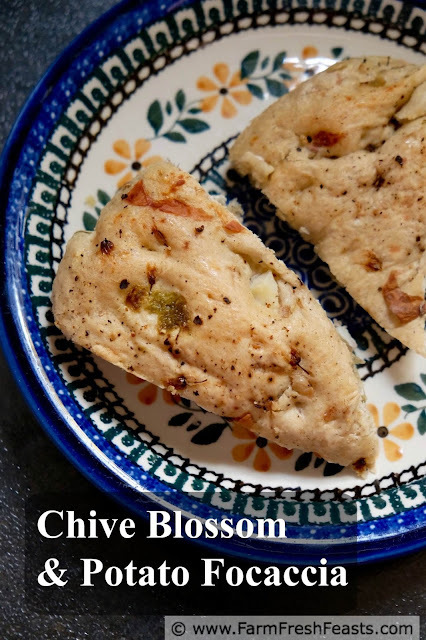 A seasoned and seasonal bread, this chive blossom focaccia is spiced with roasted chiles and chunks of potato. 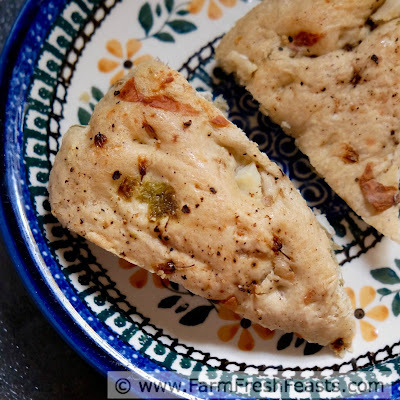 This savory Spring bread is great with a bowl of light soup or along side a simple grilled dinner. I am thinking about inheritance today. After touring some lovely homes yesterday and learning about the items my hosts inherited, I got to thinking about what I've inherited. Material things, not values and quirks--that's for another post. I've inherited jewelry. I've inherited furniture. But today, I'm thinking about the plants I've inherited. While I was stationed overseas, houseplants were one item that I inherited from folks moving on to new duty stations. I enjoyed them during my time, and when I left I passed them on to a new arrival. Houseplants are a quick way to make a new place feel more like a home, and my worms and I nurture more than we kill so our net is positive. Most of the plants are ones I have inherited on a more permanent basis. Even though I don't live in Virginia any more, the daffodils and tiger lilies my dad planted are still blooming each year. My dad is to daffodils what John Chapman was to apple trees--he's planted bulbs in 3 states and the District of Columbia. The daffodils Dad planted our first Fall here in Ohio are just starting to bloom. Yes, I am kicking myself that I didn't raise the camera just a tad more. My newest plant inheritance is a clump of chives. My folks' most recent downsizing coincided with the beginning of gardening season and their giving up their last community garden plot (after more than 20 years as community gardeners in 2 places). My dad dug up the chives one morning in Maryland, and I plunked them into a hole in my backyard the next day in Ohio. Last Spring was my first year with chive blossoms, and I happily harvested them to make all sorts of recipes. 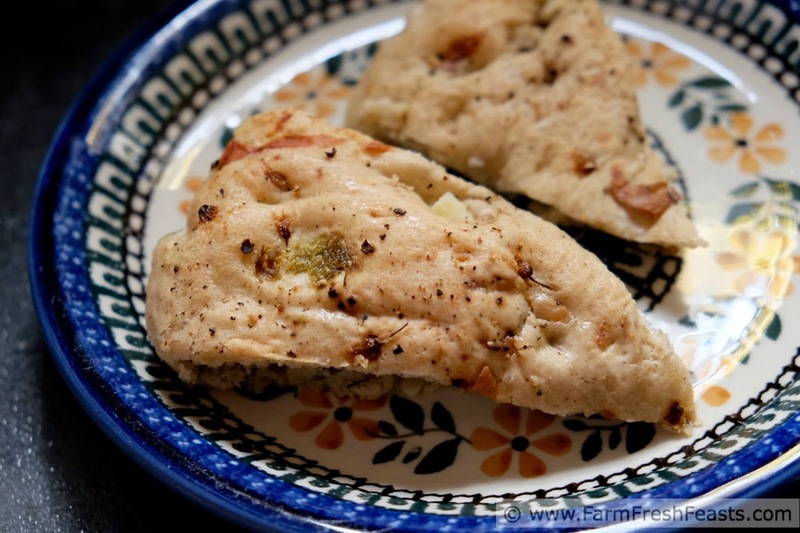 Here's my first one--a focaccia bread that was terrific as an appetizer when dinner was delayed due to SPRING! Weather and the need to get out and dig. I'd pair this with my Finnish Summer Soup with Kale if I were going to make it soon, as the cool evenings are still soup weather around here. For more recipes using herbs, please see my Recipes Using Herbs Collection. 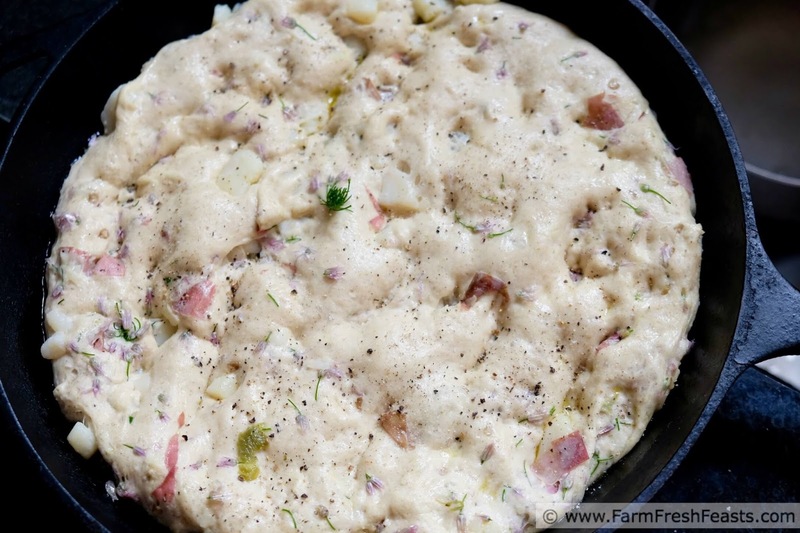 For more recipes using potatoes, please see my Potato Recipes Collection. For more recipes using roasted Hatch chiles, please see my Hatch Chile Recipes Collection. These collections are part of the Visual Recipe Index by Ingredient, a resource for folks like me eating seasonally from the farm share, the farmer's market, and inherited plants in the back yard. Note: This recipe calls for a cup of chive blossoms. 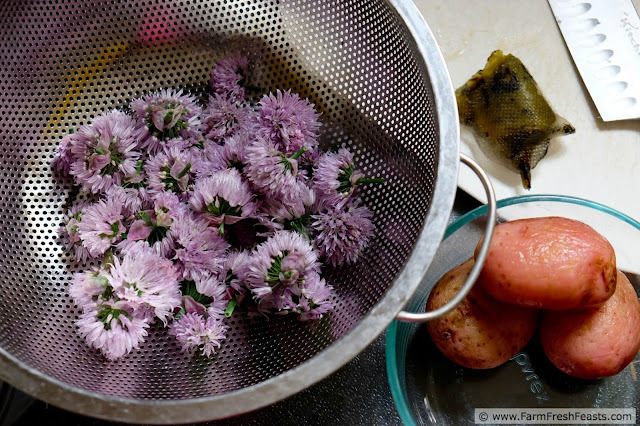 Use some of your haul to make Cathy Barrow's Chive Blossom Vinegar (then stay tuned for recipes using your vinegar). Another Note: The focaccia directions come from Donna Rathmell German's book The Best Pizza is made at home (Amazon affiliate link). I came up with the toppings myself, based on what I had that I thought would go well together. I'd use a 4 ounce can of diced roasted green chiles if you don't have any roasted chile peppers on hand. In a large bowl (I use my stand mixer) combine the yeast and water. Let that sit a few minutes while you gather the other ingredients. Add in the flours, ¼ teaspoon salt and 1 Tablespoon olive oil. Mix at low speed (with a paddle, but a hand mixer or a spoon and lots of forearm work would do) until the dough starts to come together, then stop and scrape down the sides of the bowl. Mix again at medium speed until the dough is a smooth ball, another 5 minutes or so. Refer to my Pizza Primer post for photo collages of what the dough should be looking like at various stages. 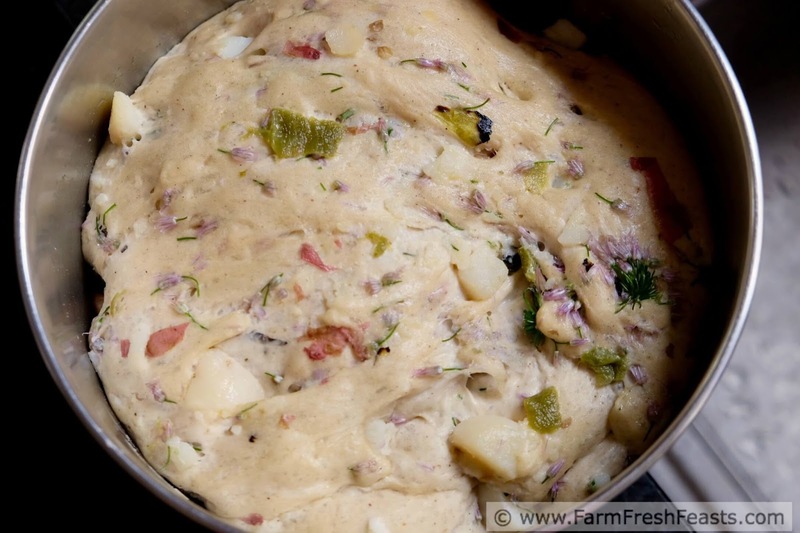 Add the chive, potato, and chiles to the bowl and mix until combined (another minute or two). Transfer to an oiled bowl and let rise for an hour until doubled. Use some of the remaining oil to grease a 12 inch skillet (I use cast iron) or deep dish pizza or cake pan. Save a bit to brush the top of the dough. Dump the risen dough into the greased pan, and pat it to the edges using your fingers. Cover with a kitchen towel and let rise in a warm area for another 30 minutes. I've used the Bread Proof setting on my oven, the top of my refrigerator, and the sunny table in my breakfast nook with good results. Remove the towel and lightly press the dough with your fingertips, to leave small indentations. Brush with a bit of olive oil, then sprinkle with a generous pinch of salt and several grinds of pepper. Bake for 25 to 30 minutes until the crust is lightly golden. Cut into wedges to serve. Follow me on Pinterest for more recipes. Follow me on Facebook for articles that catch my eye, recipes, and what's up in the kitchen. Follow me on Instagram for a curated look behind the scenes and photos of the universe's most handsome Basset hound, Robert Barker. Want to know How to Use This Blog? Our raspberries are from the Hubby's uncle so that's our inheritance. Meghan, Meghan, Meghan--you gotta try Cathy's Chive Blossom Vinegar. I harvested all my blossoms, used some in her vinegar, and then started looking getting ideas for the rest. It's all in the timing. Cathy's post showed up in my email right when my chive blossoms were starting to bloom and I grabbed the scissors (and the camera) and went out to harvest right after reading. 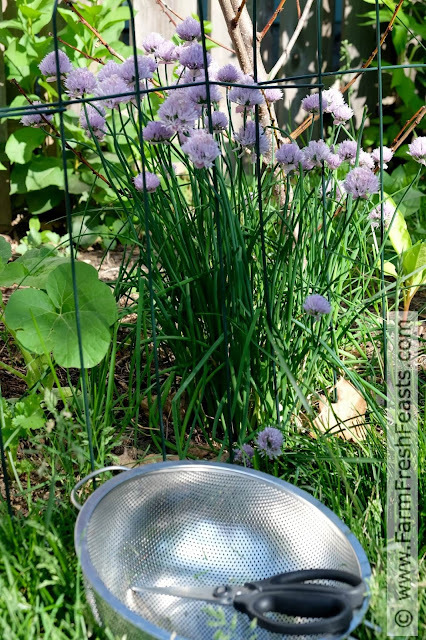 I'm hoping to put chive blossoms in folks' brains with an early 'hey I noticed my chives are up, better get this out' type of post. I think inherited raspberries sound awesome. There is something raspberry-ish that emerged from our strawberry patch the same time new canes were emerging from our raspberry patch last year. I let it go, and if it makes raspberries in the strawberry patch this year I'm all for it. If it's just some bramble then it's GONE. I love having garden keepsakes, they are so precious. When we moved I made a temporary garden in my neighbor's yard with divisions of all my favorite plants. Then once our new home was ready I divided again. So I still have the peony we planted when my son was born. Sentimental! 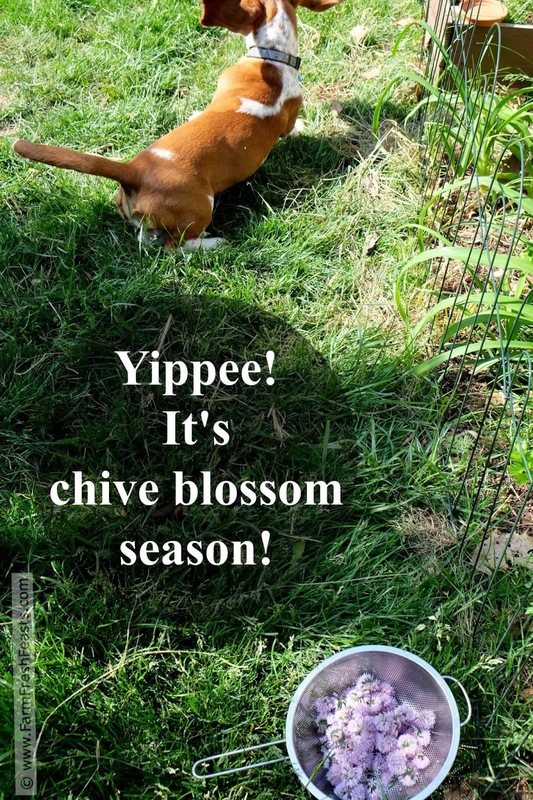 I have chives too. 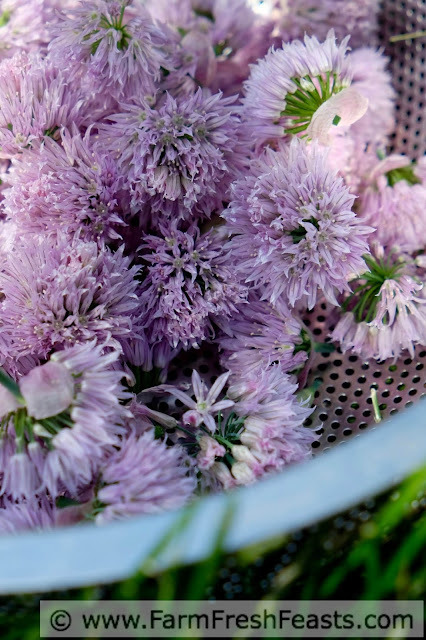 Chive blossoms are certainly a very special seasonal item, I don't have enough chives to harvest them, I'd rather enjoy the flowers! What a great idea for a temporary garden! That's always the tough one with moving, especially in summer trying to figure out how to keep all of the plants.